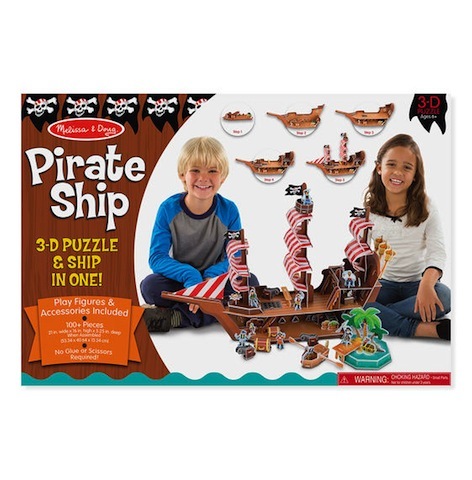 Take puzzle building to swashbuckling new heights with this pirate ship play set and puzzle in one! Detailed section by section instructions help kids fit together the more than 100 foam pieces--with no glue or scissors required--into a multi-level pirate ship, complete with three masts, a crow's nest, ship's wheels that spin, a working hatch, and even a plank to walk! 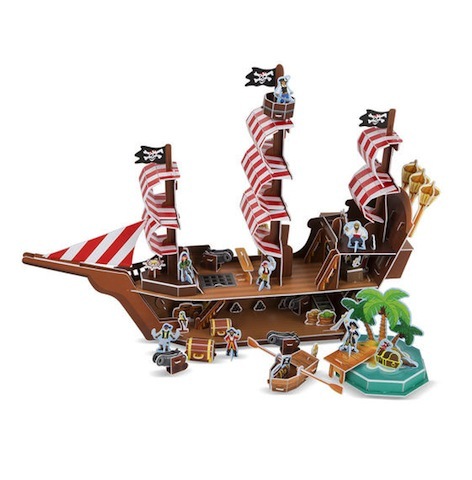 The set includes a separate deserted island and row boat, accessories and play pieces like a treasure chest, cannons, and pirate and parrot play figures to use with the sturdy 15-inch-high ship for endless hours of play. Pieces and sections are color-, shape-, and number-coded for easy but entertaining assembly. The 3-D puzzle helps children six and older to develop hand-eye coordination, concentration, attention span, and an understanding of spatial relationships.